Our Wonderfilled Life: Get a Melissa & Doug 25% Off Coupon When You Take the North "Poll"
It is no secret how much we love Melissa & Doug here !! Their toys are imaginative, durable, designed well, educational, and we included them in our first Boy Wonder Toy Awards! We have something fun for you AND it will help you get a jump on your holiday shopping! 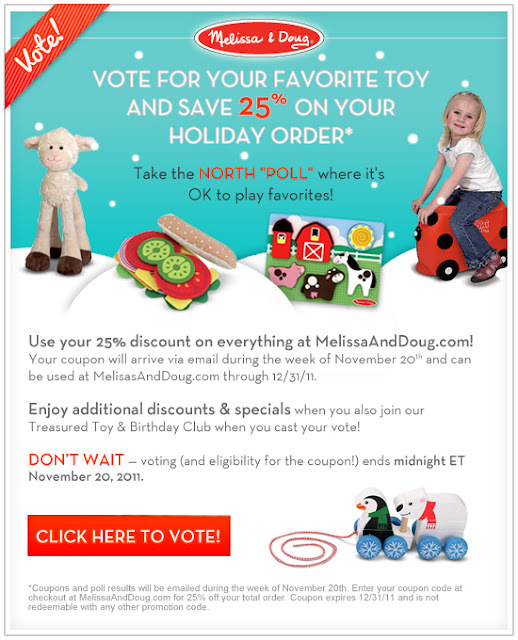 Remember you must click the above image to cast a vote by November 20th to receive your 25% off coupon at MelissaandDoug.com. I don't think it could be any easier!! Enjoy my friends! !